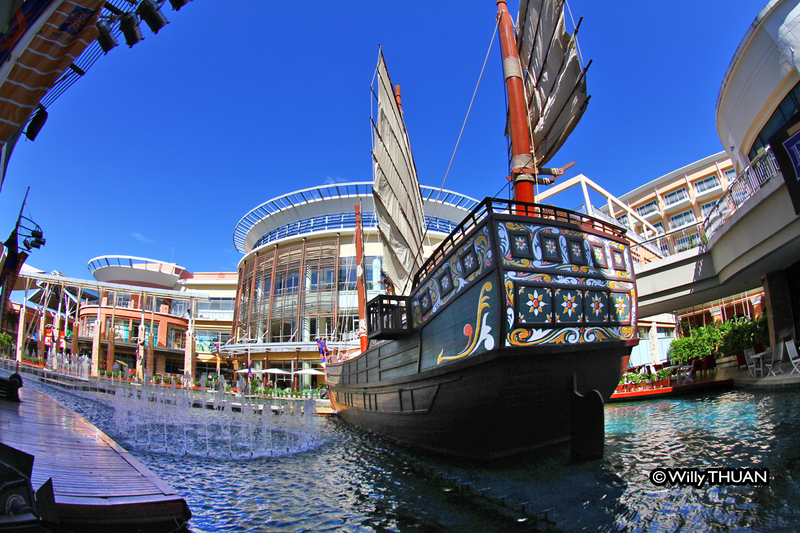 What to Do at Jungceylon? 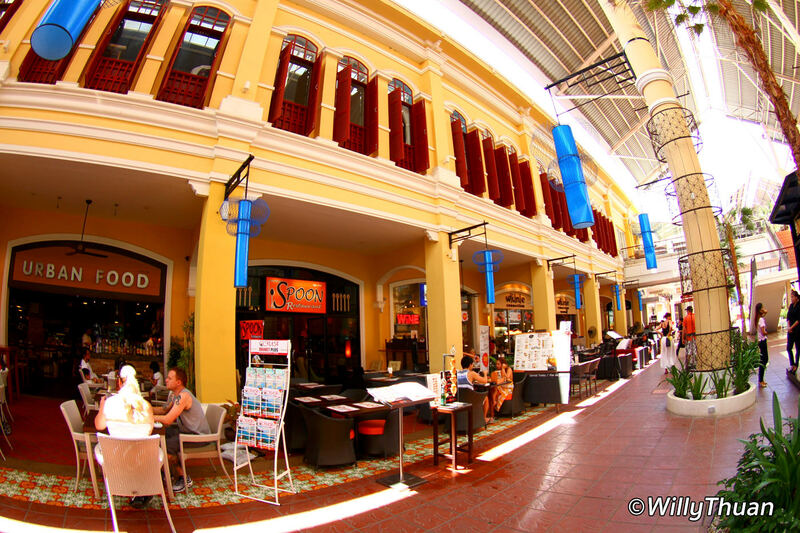 Located in the very centre of Patong beach at the end of Soi Bangla, Jungceylon Shopping Center also features the Millennium Resort, a large hotel, plenty of restaurants, six rooms cinemas, bowling and Big C a two storey supermarket. And the list goes on. Plenty of choices, but more pricey than anywhere else. To give you a scale: a double espresso at Starbucks is 100 Baht here while 80 Baht at Central Festival. On a scorching day, you still can eat Thai food in an air con room. 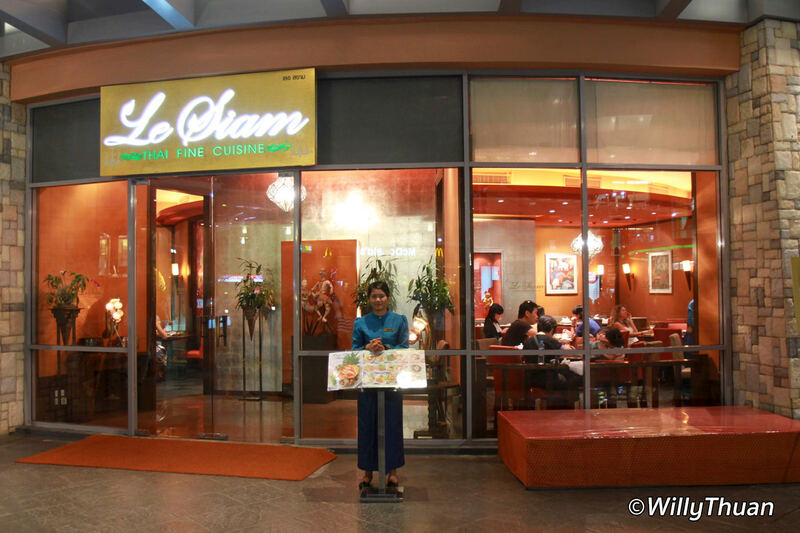 Le Siam – Serves a decent Thai food, maybe a bit less sophisticated. Not spicy and affordable. MK Gold Suki – The luxury version of MK Suki, better quality of food, more choice, design and layout a bit cosier and as you expect, more expensive. You also get a lot of ‘Wai’ in there (Polite Thai greeting). Fuji Japanese Restaurant – A popular descent Japanese Restaurant. As it is a franchise, quality is consistent. Shabushi – a fun concept of cooking your food (and still pay for it). It’s like MK Suki, but you get your boiling pot and the ingredients, such as meat and veggies, are always passing by on a moving belt in front of you. Probably great for the kids, but the choice is limited, and quality is so-so. 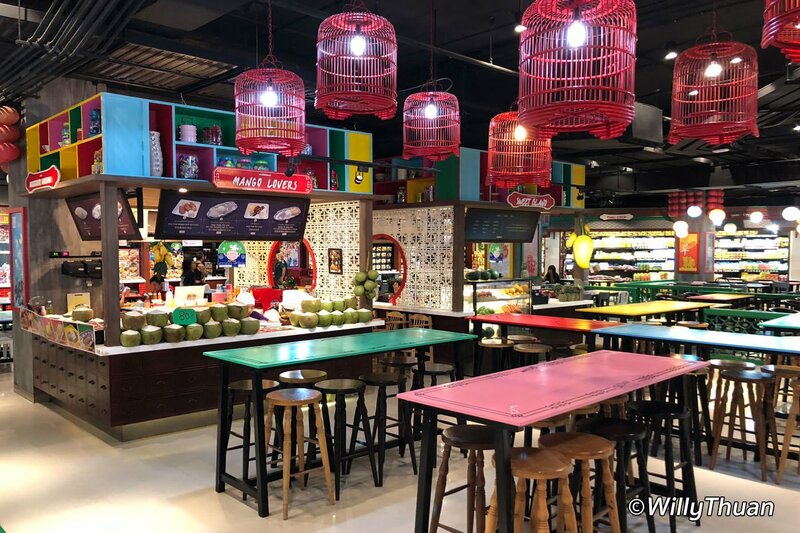 Wine Connection – this popular franchise is serving affordable European and Thai food, and as the name implies, they also have a wine cellar at a reasonable price too! The classics: Subway, Burger King, 2 Starbucks, (yes! 2!) Haagen Dasz. 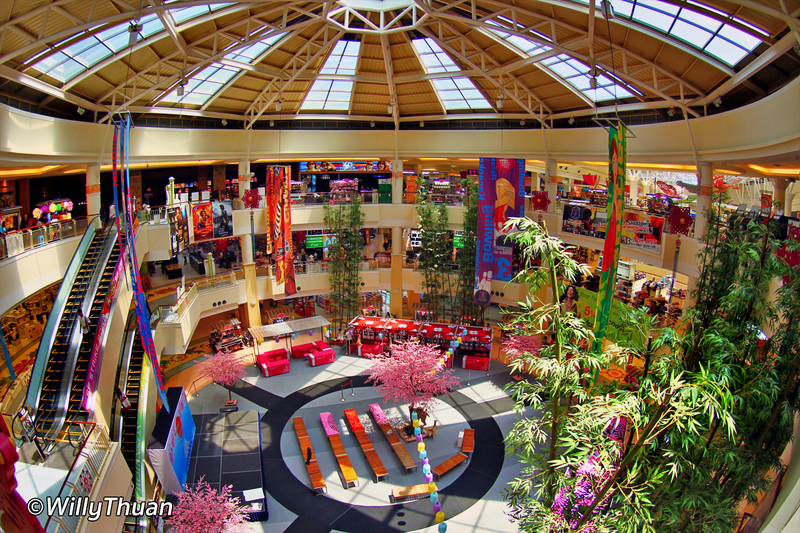 The Food Court: Located under the mall, where all the souvenir shops are, the food court has a lot more food to offer than people expect, and it is often a lot more real than most tourist restaurants found in the streets nearby. 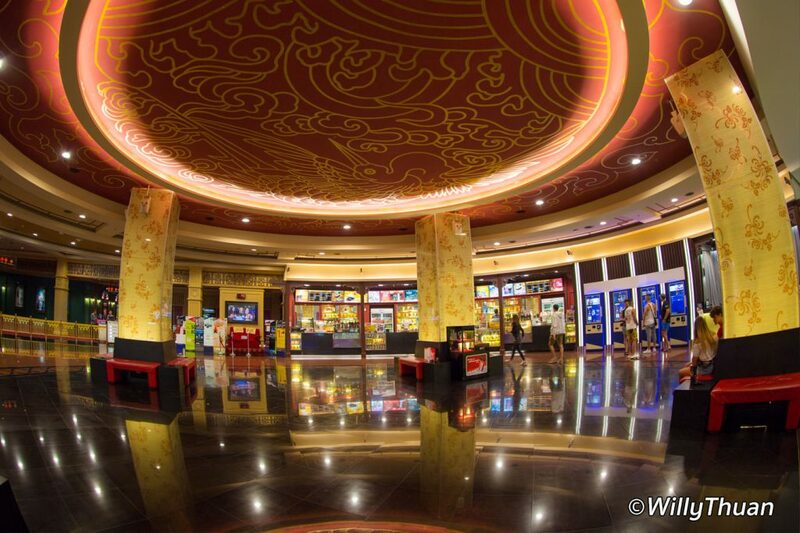 The central cinema consists of 6 Rooms Movie Theater. Next, a 4D Mini Movie Theater is where you wear 3D glasses on moving seats and pay to get motion sickness going down a virtual roller coaster. You’ll find plenty of Foot Massage and ‘Thai Massage‘ at the underground level. Prices are good, and it’s a great way to relax the day after the party. Let’s not forget the ‘Fish Spa’ where supposedly hungry little suckers will ‘eat your dead skins’… Just try not to think who dipped his sick legs in this aquarium before you. Enjoy 12 lanes Bowling with loud music and fluorescent flashing lights, pool tables, Karaoke boxes, pinballs and video game. A large playground for kids is now available on the top floor. It’s vast, colourful and all made of bouncy rubber so kids can have tons of fun in there. The team in charge seems to be attentive and responsible, and parents can go for a short shopping spree knowing that kids are in a safe and fun place. 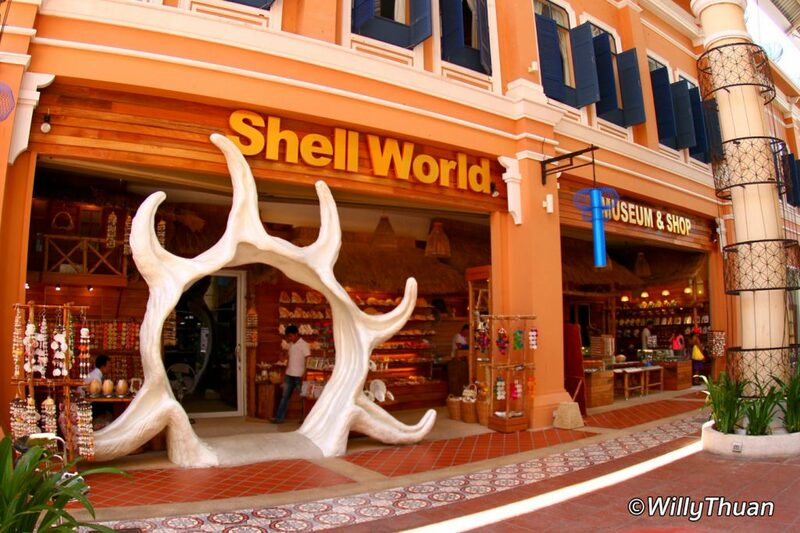 The Shell Museum is a museum displaying shells! A lot of shells! Enough said. 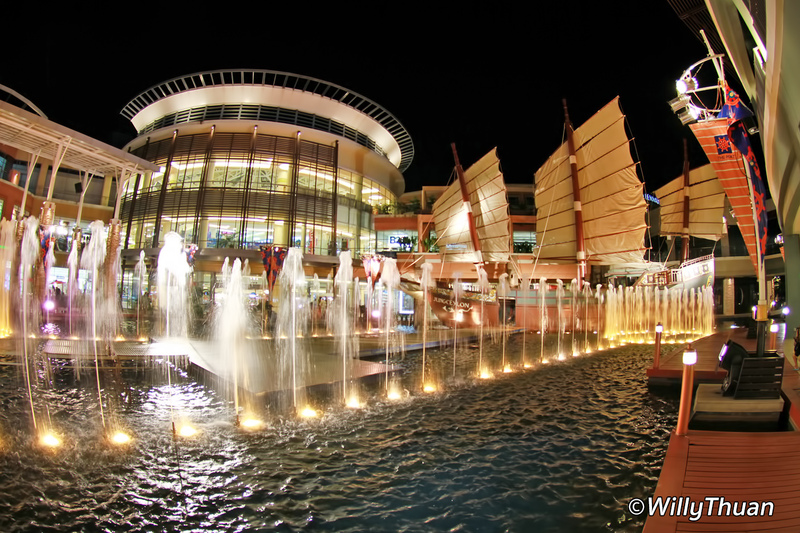 A daily Water and Light show narrate the history of Phuket while will spray you all over when you pass by on a windy day. Blue facials are the latest trend in town. It’s fun to try, and even more to watch. 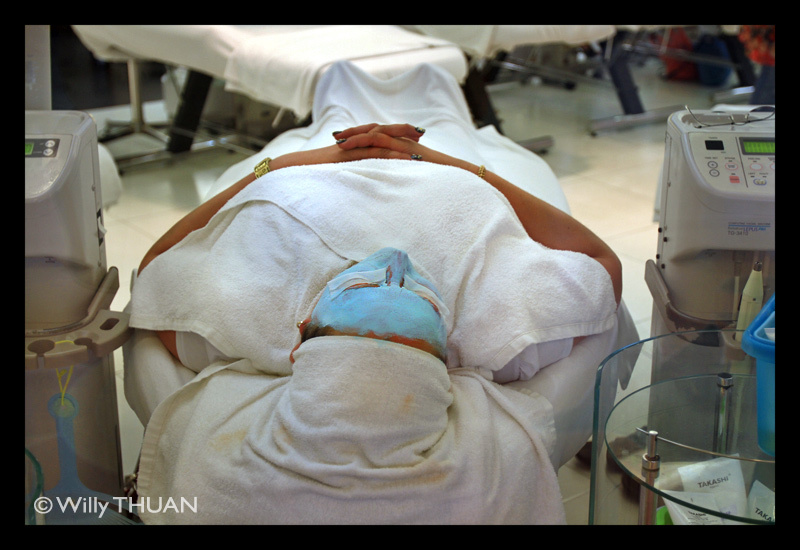 Behind a large window, an army of beauticians pampers a large number of people comfortably installed on beds with some blue cream all over the face. Look closer: most people on the beds have beards, hairy chests and tattoos!… nothing wrong with it of course, but you might not expect men to occupy 80% of the beds ;). This business, started with Hanako Tokyo, became so popular and very lucrative, they opened two more, all competing for the modest sum of 299 Baht! Evening entertainment is frequent on the central plaza usually set up as a beer garden: concerts, performance and live bands or exhibits. 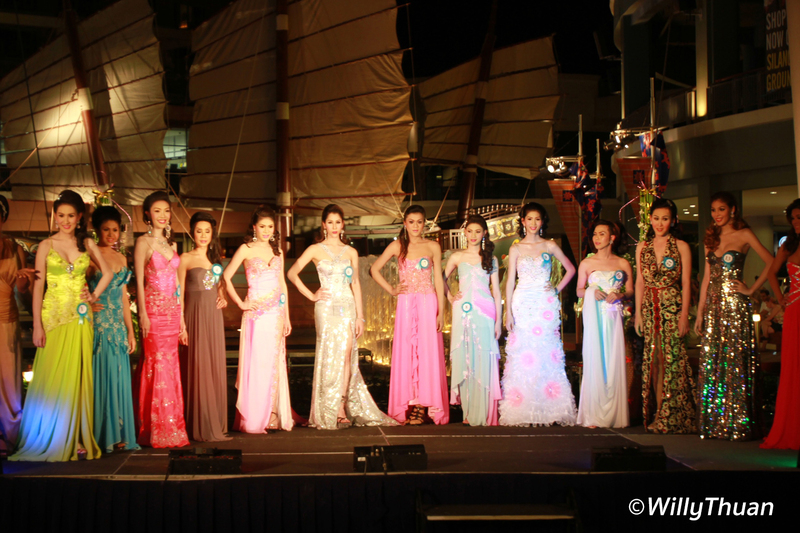 Few brands are available in Jungceylon, mostly at Robinson Department Store and in the first building. ‘Big C’ is now the supermarket since Carrefour is gone. Apple shop, computer shops and large sports shops should keep you busy for a while. 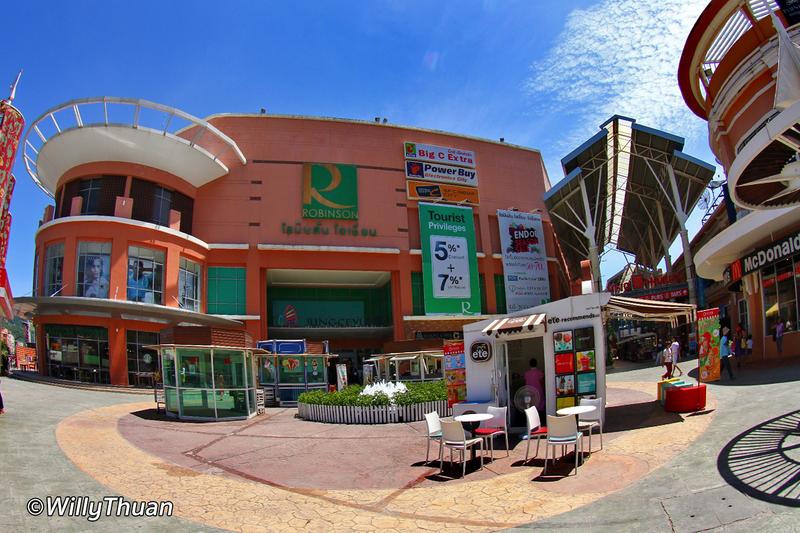 For phones, games and electronics, go to the top floor of the second building, next to the cinemas. 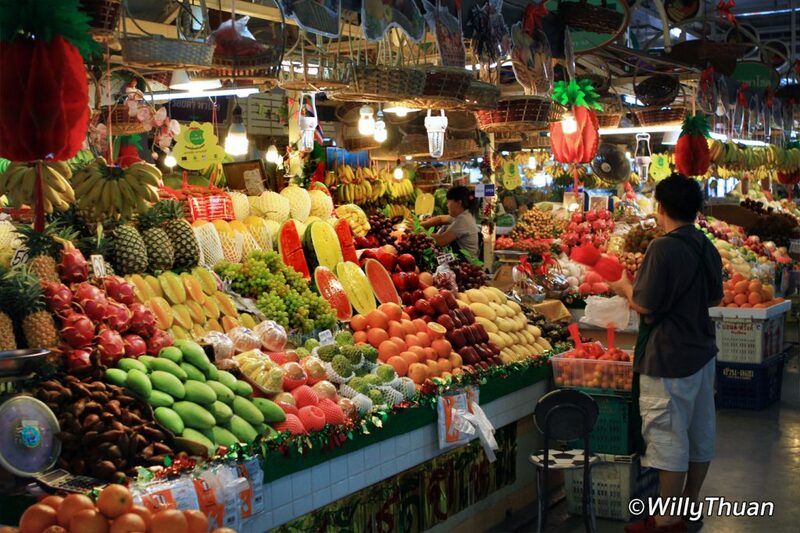 The Banzaan Fresh Market located just behind Jungceylon Phuket has a fantastic display of tropical fruits. You also can buy your fish at the ground floor and take it to the restaurants upstairs to have cooked for a small fee.